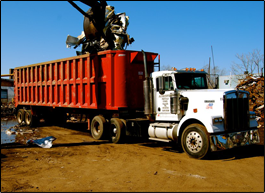 With over 80 years of experience serving the Boston area, Anestis Metals is a family owned and operated scrap metal recycling business. Anestis Metals is known for high-quality service to both commercial and residential customers. We specialize in the hauling and buying of scrap metal throughout Northeastern Massachusetts and the Greater Boston area. We recycle thousands of tons of metal every year, and no project is too large or too small for us to handle. Anestis Metals provides 15, 20, and 30 yard dumpsters for rent for two week time spans. Our dumpsters are perfect for both residential projects and commercial projects.